This is a plain white text on black background message style, I made older conversations gray and used 'vibrant' colors for time stamp and names. It's great for someone who needs to match a white on black contact list style. C. Used a plain text type format. So I made this one! I hope you enjoy, I really have 0 knowledge of CSS programing- just a little HTML knowledge, so this was made 100% through trial and error. In the screenshot I left some old conversation to show the gray that it converts to. Also, for some reason, the colors of the name and time in the sample picture are actually darker and blander than what it actually looks like. I think it’ws the format; white-on-black in itself is a pretty good idea. I like it, it makes it easier for me to copy & paste conversations. It also reminds me of my linux terminals. 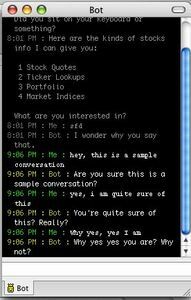 were you get that chat bot? is genial! Huw Rowlands- I used his justtext as the basis for this Xtra.